The Arctic Ocean has long been the least accessible of the world’s major oceans. But as climate change warms the Arctic twice as fast as anywhere else, the thick sea ice that once made it so forbidding is now beating a hasty retreat. Since 1979, when scientists began using satellites to track changes in the Arctic sea-ice expanse, its average summertime volume has dropped 75 percent from 4,000 cubic miles to 1,000 cubic miles. 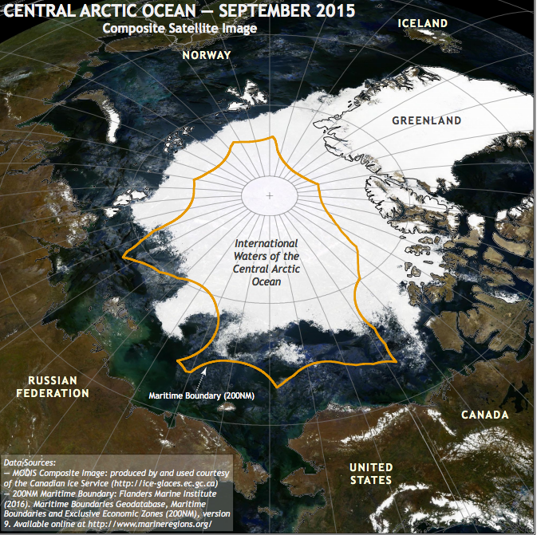 By September, the Arctic Ocean will have swapped nearly 4 million square miles of ice for open ocean. This accelerated transformation has troubled scientists, conservationists and government officials who are anxious about the fate of the fish that may live in these waters—and for the entire ecosystem itself. At the center of the Arctic Ocean is a 1.1 million square-mile “donut hole,” surrounded by Canada, the Danish territory of Greenland, Norway, Russia and the United States. The donut hole does not fall under any country’s jurisdiction, and it may well be the last unexploited fishery on Earth. According to international law, anyone could fish these newly opening high seas, if they desired, and thanks to the retreating ice, they may soon have their chance. Map of the area of northern Barents Sea including the waters around Svalbard where some of the world’s largest seafood and fishing companies have committed not to expand their search for cod into. The agreement aims to avoid the tragedy that occurred in the Bering Sea in the 1980s. At the time, the U.S. and the Soviet Union fished for pollock within their respective waters. Almost no one believed there were fish—or foreign fleets—in the international waters between them, says David Benton, a retired fisheries manager from Alaska and a member of the U.S. Arctic Research Commission. A pair of Alaskan fishermen who thought otherwise chartered an airplane to fly over the donut hole and spotted close to 100 working vessels. At its height, fishing fleets from Japan, China, Poland, South Korea and others were drawing more than a million of tons of pollock from the waters annually. 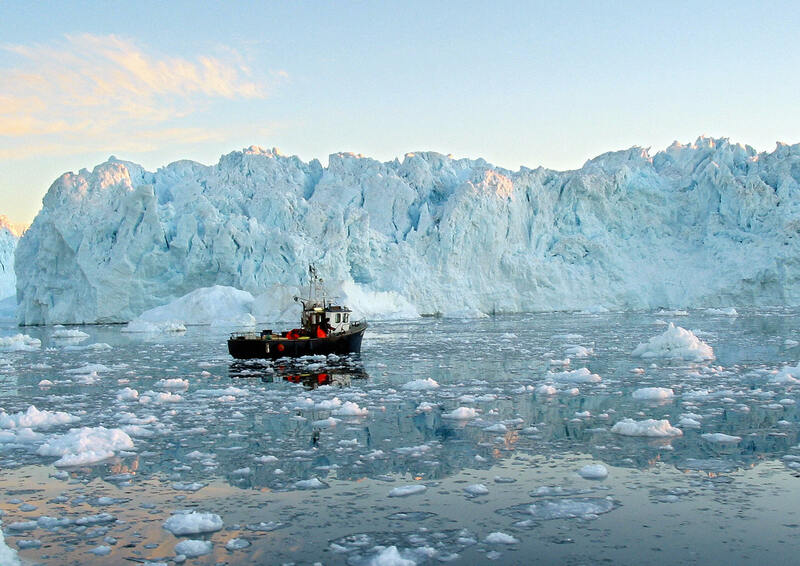 A fishing boat cruises in the Ilulissat fjord, on Greenland's western coast. An international treaty was quickly negotiated, but it was too late. By the early 1990s, the pollock stock had collapsed. Twenty-five years later it has still not recovered. 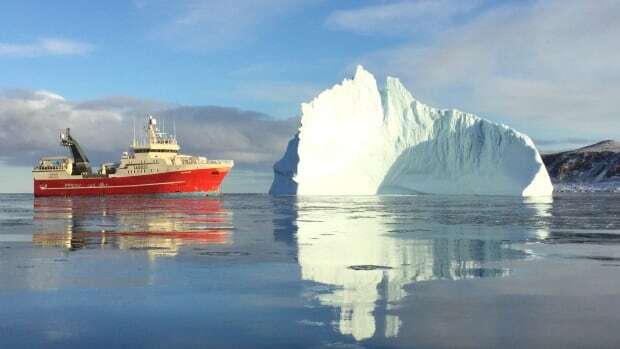 “There has been a lot of discussion about shipping in the Arctic Ocean, but in my experience the first people into an ocean are the fishermen,” says Peter Harrison, an Arctic policy and fisheries expert at Queen’s University in Canada, and a former deputy minister of Canada’s Department of Fisheries and Oceans. Lately, as much as 42 percent of the central Arctic Ocean is open water during the summer months. After three years of collecting data, the highest resolution map of Earth’s lithospheric magnetic field from space to date has been released. The dataset combines measurements from ESA’s Swarm satellites with historical data from the German CHAMP satellite using a new modelling technique that allowed scientists to extract tiny magnetic signals from Earth’s outer layer. 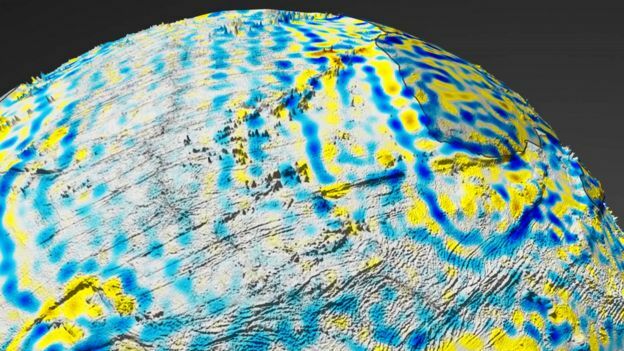 It is the best depiction yet of the magnetism retained in Earth's rocks, as viewed from space. The map was constructed using data from Europe’s current Swarm mission, combined with legacy information from a forerunner satellite called Champ. Variations as small as 250km across are detectable. Clearly seen are the "stripes" of magnetism moving away from mid-ocean ridges - the places on the planet where new crust is constantly produced. This pattern - the consequence of periodic changes in Earth's polarity being locked into the minerals of cooling volcanic rock - was one of the key pieces of evidence for the theory of plate tectonics. On land, the signal tends to reflect the composition and thickness of the different rock layers that make up the continents. Generally speaking, younger crust will be thinner and have a low content in magnetic minerals. Whereas, the old cratons, those stable interior sections of continents, will tend to be thicker and have a higher magnetic mineral content. Detecting any of this from orbit is a challenge because the signals are dwarfed by that part of the global magnetic field coming from the dynamo - the movement of liquid iron in the Earth's outer core. Stand on the surface of the planet and the intensity of the global field may be between 25,000 and 65,000 nanoTeslas (a fridge magnet is a thousand times stronger). 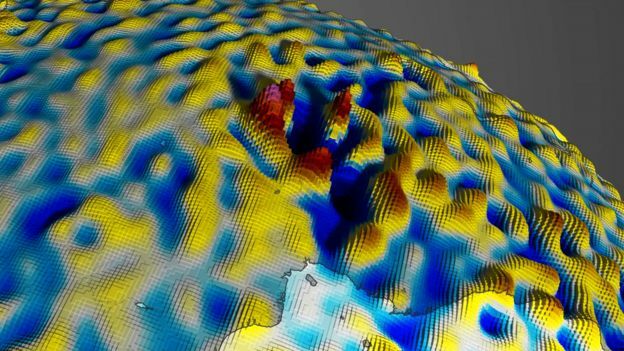 "Again it depends where you are but the lithospheric signal is well below 100nT, even 50nT, on average," explained Nils Olsen from the Technical University of Denmark and one of the scientists who created the new space map. "But we have certain regions where it can reach up to 2,000nT, and one of these regions is the Bangui anomaly in western Africa," he told BBC News. This sharp signal in the Central African Republic is the possible impact site of a large iron asteroid more than 500 million years ago. Another high intensity region in the crust is the famous Kursk anomaly in central Russia where substantial reserves of iron ore have been mined. 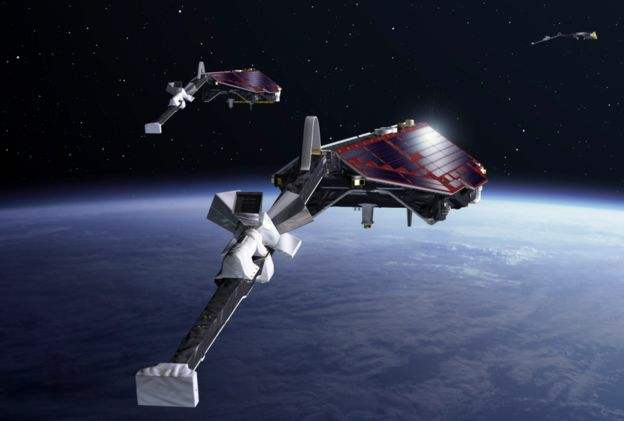 The German Champ spacecraft measured Earth's magnetic field from orbit between 2000 and 2010. It was succeeded in 2013 by the Swarm trio of satellites operated by the European Space Agency (Esa). Champ was lower in the sky than Swarm is currently, and so found it easier to detect the lithospheric magnetism. However, the sophistication of the new mission and the subtle differences the newer satellites can sense in side-by-side observations mean further detail still can be extracted from the data. Champ alone was getting a resolution of 300-330km, so the combined model is a big step forward. Our very best global view of crustal magnetism is the World Digital Magnetic Anomaly Map (WDMAM), which was put together by scientists over many years, and includes much high-resolution aero- and ship-borne measurements. But the WDMAM would be very patchy if it did not also include space data, said Mike Purucker from the US space agency. 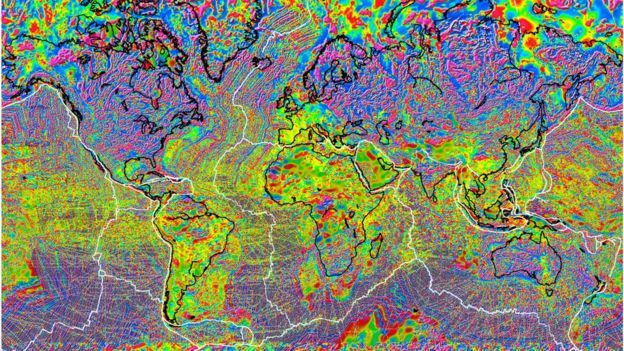 "The World Digital Magnetic Anomaly Map is a 5km grid at 5km altitude around the world. The longwave component is provided by satellite observations and the shorter wavelengths by aero and marine surveys. 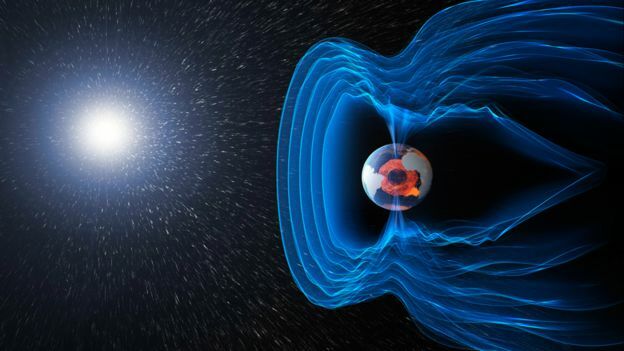 "[The satellite data] defines better the magnetic field under the auroral ovals where it has been very difficult to separate internal from external fields," he told the BBC. Future versions of the WDMAM will now make use of the updated Champ/Swarm view. Having maps of crustal magnetism is important for investigating the geological history of Earth and for understanding the distribution of commercially important mineral resources, says Kathy Whaler from Edinburgh University, UK. "[The new Swarm/Champ] model should mean estimates to the depth at which magnetisation is lost are better. "Our assumption is this is where the temperature reaches the Curie point. There has previously been a suggestion that this is deeper in some subduction regions, as well as possibly over old, thick, stable cratons, for example. "We should be able to estimate these depths as a function of position on the surface more accurately, and thereby understand some of the large-scale tectonics better." Swarm itself is trying to provide greater insights on all of the different contributors to the global magnetic field. As well as the rocks and that dominant signal coming from the swirling convection of molten iron in the core, there are other inputs pulling on the needle of every compass. These include the magnetism generated by electric fields high above the Earth, and even a very subtle effect derived from the movement of salt water ocean currents. Long-term observations will tease apart the size of each contribution and how it varies through time. "The Bravo satellite is still at slightly above 500km and the Alpha and Charlie satellites are at 443km, roughly. So we are still at a good altitude,” said Esa's Swarm mission manager, Rune Floberghagen. “Considering the fuel situation, we are set for a very, very long mission - far beyond the upcoming solar minimum and following solar maximum, and perhaps even up to the solar minimum after that." This would mean at least one Swarm satellite still working in 2031.
as measured by ESA's Swarm trio of satellites. It is a fascinating prospect because one key to understanding Earth's magnetic field is seeing how it interacts with the magnetic fields and particle matter emanating from the Sun over its 11-year cycle of activity. The new lithospheric magnetic field map was presented on Tuesday at an Esa Swarm science meeting in Banff, Canada. 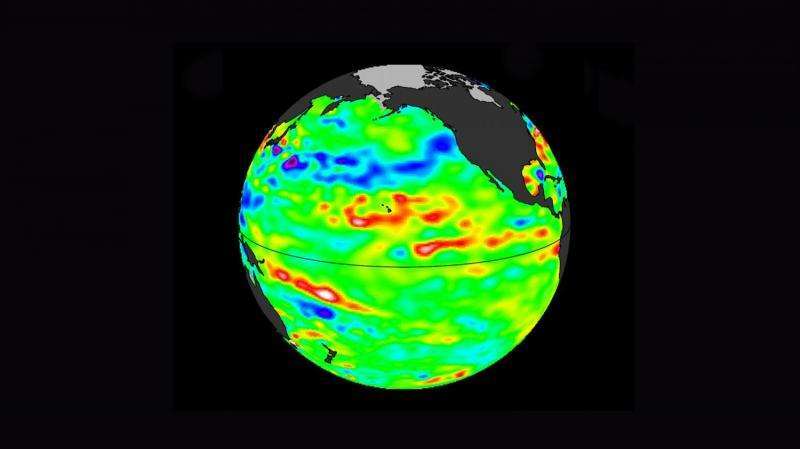 show the rise and fall of an El Niño. NASA Earth Observatory visualization by Joshua Stevens, using data from the Global Data and Assimilation Office. Note: The following is an excerpt from El Niño: Pacific Wind and Current Changes Bring Warm, Wild Weather. The ocean is not uniform. Temperature, salinity, and other characteristics vary in three dimensions, from north to south, east to west, and from the surface to the depths. With its own forms of underwater weather, the ocean has fronts and circulation patterns that move heat and nutrients around its basins. Changes near the surface often start with changes in the depths. Spanning one-third of Earth’s surface, the tropical Pacific Ocean receives more sunlight than any other region on Earth, and much of this energy is stored in the ocean as heat. Under neutral, normal conditions, the waters near southeast Asia, Indonesia, and Australia are warmer and sea level stands higher than in the eastern Pacific; this warm water tends to get pushed west and held there by easterly trade winds. But every two to seven years, this pattern is disrupted. During El Niño events, the surface waters of the central and eastern Pacific Ocean become significantly warmer than usual and wind patterns change. Easterly trade winds (which usually blow from the Americas toward Asia) falter and can even turn around into westerlies. This allows great masses of warm water to slosh from the western Pacific toward the Americas. The arrival of this warm water reduces the upwelling of cooler, nutrient-rich waters from the deep—shutting down or reversing ocean currents along the equator and along the west coast of South and Central America. The “western Pacific warm pool” and the waves that propagate from it can extend down to 200 meters in depth, a phenomenon that can be observed by moored or floating instruments in the ocean: satellite-tracked drifting buoys, moorings, gliders, and Argo floats that cycle from the surface to great depths. These in situ instruments (more than 3,000 of them) record temperatures and other traits in the top 300 meters of the ocean. The still image at the top shows a cross-section of the Pacific Ocean in November 2015, near the peak of the most recent El Niño event. Based on data from the Global Data and Assimilation Office, the map shows temperature anomalies; that is, how much the temperatures at the surface and in the depths ranged above or below the long-term averages. The animation shows the changes in the Pacific from January 2015 through December 2016. By March 2016, cooler water begins moving east, sparking a mild La Niña in the eastern Pacific late in 2016, while the western Pacific begins to warm again. Data collected Feb. 28 - March 12, 2017, by the U.S./European Jason-3 satellite show near-normal ocean surface heights in green, warmer areas in red and colder areas in blue. Ocean surface height is related in part to its temperature, and thus is an indicator of how much heat is stored in the upper ocean. El Niño’s episodic shifts in winds and water currents across the Pacific can cause floods in the South American desert while stalling and drying up the monsoon in Indonesia and India. The atmospheric circulation patterns promote hurricanes and typhoons in the Pacific while knocking them down over the Atlantic. Fish populations in one part of the ocean might crash, while others thrive and spread well beyond their usual territory. El Niño is one of the most important weather-producing phenomena on Earth, a “master weather-maker,” as author Madeleine Nash once called it. Learn more about the phenomenon in our feature story El Niño: Pacific Wind and Current Changes Bring Warm, Wild Weather. Phys : Could leftover heat from last El Nino fuel a new one? GeoGarage blog : El Niño unveiled in incredibly detailed animation / La Niña might not be coming after all / One year time lapse of the 2015-2016 El Niño event / Environmental records shattered as climate change ... / NASA examines El Niño's impact on ocean's food source / The strongest El Niño on record may be brewing in the ... / Studying the heart of El Niño, where its weather begins / A still-growing El Niño set to bear down on U.S. In the northern hemisphere, the vernal equinox heralding the beginning of spring occurred Monday. Although there’s still snow on the ground and cold weather in the forecast, one can’t deny the new season has arrived. Astronomical spring begins when the sun reaches a certain height over the equator each year. While nearly everyone knows spring arrives around March 20, what’s actually occurring in terms of the relationship between the earth and the sun still isn’t universally understood. On both the vernal and autumnal equinoxes, the sun is directly overhead at noon at some place along the equator of our planet. This year, the first of these two occurrences happened at 6:29 a.m Eastern Standard Time on March 20. Basically, if you were in central Africa and looked up at noon, the sun would be directly above your head, forming a 90-degree angle with the ground. On Friday, Sept. 22, at 4:02 p.m., the same thing will occur at a different spot along the equator to begin the fall season. It falls at the same instant around the globe. The moment of the vernal or spring equinox was yesterday 10:29 UTC. That marks the moment when the sun crossed the equator and its axis was tilted neither toward or away from the sun. Just before sunrise, the sun is even with the horizon and then rises during the day, reaching the maximum height exactly between sunrise and sunset. The highest point the sun reached around Boston Monday is about 48 degrees above the horizon. This angle will continue to increase until the first day of summer, when it’s at about 71 degrees. The spring equinox always falls on March 19, 20, or 21. It most often will come on the 19th or 20th. The next time it will fall on March 21st will be 2101. From then on it falls, reaching a minimum of 24 degrees as winter begins. Other places on the planet have different maximum heights. 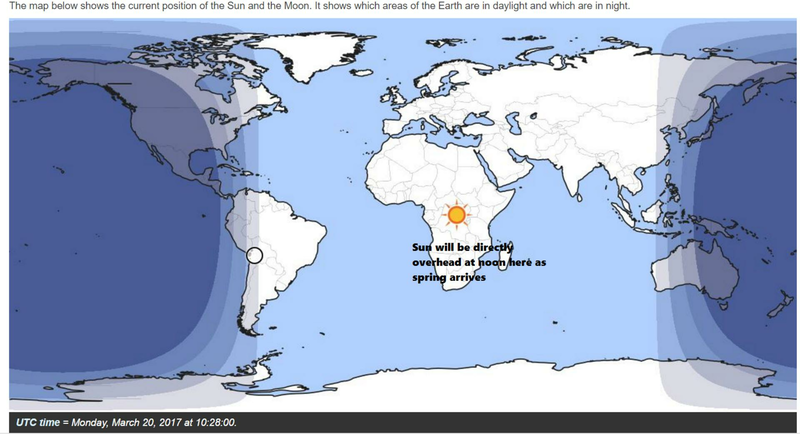 There’s always someplace where the sun is directly overhead, but it only occurs exactly at the equator on the equinox. On the first day of spring, the sun will reach different maximum heights across the planet. The sun is up all day at the South Pole during our fall and winter, but down all day during our spring and summer. While nearly all spots on Earth have about 12 hours of darkness and light as spring begins, it’s not exact. Depending on where you live on the planet, the day on which you have equal day and night shifts on the calendar. Multiple factors cause this, including the shape of the planet and the way the sun’s light is bent as it passes through the atmosphere. In a world in which many of us are overextended and stressed, the fact that the planet is spinning around a tilted axis at over 1,000 miles per hour can be lost. With the arrival of spring, take a moment to ponder the changes occurring, and how the increase in light and strength of the sun will soon be melting the snow, warming the earth, and bringing about that magical and dramatic metamorphosis to our landscape known as spring. 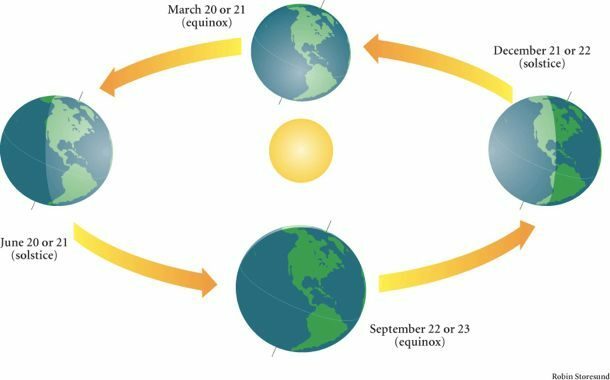 Christian Science Monitor : Spring equinox 2017: What is an equinox anyway? “I saw this huge ship sailing and I thought he’s in rather close, I hope he knows what he’s doing,” recalled Gladys Perkins of the day 50 years ago, when Britain experienced its worst ever environmental disaster. The ship was the Torrey Canyon, one of the first generation of supertankers, and it was nearing the end of a journey from Kuwait to a refinery at Milford Haven in Wales. The BP-chartered vessel ran aground on a rock between the Isles of Scilly and Land’s End in Cornwall, splitting several of the tanks holding its vast cargo of crude oil. The stricken oil tanker Torrey Canyon two days after she stuck fast on the notorious Seven Stones Reef, near the Isles of Scilly and Land’s End. “I just could not believe it. They’d hit the Seven Stones [reef] in broad daylight,” said the 90-year old resident of St Martin’s, the northernmost of the isles. What followed that night was an oil spill eight-miles long which grew to 20 miles long within 24 hours, and later hit hundreds of miles of coastline. 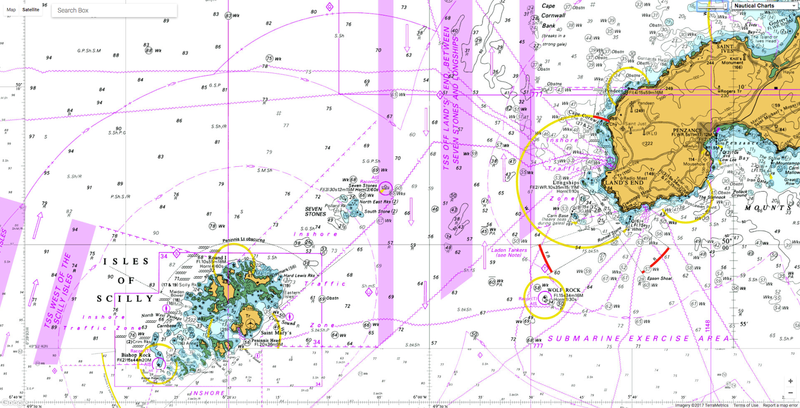 Following a navigational error, Torrey Canyon struck Pollard's Rock on Seven Stones reef between the Cornish mainland and the Isles of Scilly on 18 March 1967. The tanker did not have a scheduled route and as such lacked a complement of full scale charts of the Scilly Islands. To navigate the region, the vessel used LORAN, but not the more accurate Decca Navigator. It remains Britain’s biggest oil spill at up to 117,000 tonnes, or 1,231-times more than the amount leaked by a BP North Sea platform last year. The ripples from the spill are still felt 50 years on. An unknown quantity of the oil remains in a Guernsey quarry, where spill response teams carry out a training exercise each year. Much of the oil that washed up on Guernsey was pumped into an old quarry, fenced off to the public and used today to train disaster response teams. Today’s Department for Environment, Food and Rural Affairs and the environmental groups with millions of members are also partly a product of the incident. So is the way that authorities react to spills, and the shipping industry’s modern failsafe measures. At the time, the crisis ignited an incredible chain of responses. The government, led by prime minister and Scilly Isles holidayer Harold Wilson, unleashed RAF bombers to sink the wreck and released thousands of tonnes of detergent that proved toxic to marine life. “The cure was worse than the malady,” said Stephen J Hawkins, a scientist at the Plymouth-based Marine Biological Association, which studied the spill’s impact on wildlife and habitats. Initially it was thought the ship could be salvaged, a prospect supported by its owners, the Bahama-based Barracuda Tanker Corporation. Later, the home secretary, Roy Jenkins, said ministers considered towing it to to the mid-Atlantic and sinking it. Eventually, they decided the best way of stopping the oil pollution was to bomb and sink the stricken vessel. Ten days after the supertanker began leaking, on 28 March, Buccaneer bombers took off with the mission of sending the Torrey Canyon to the seabed. “From the hill at the back of St Martin’s we had a grandstand view of these planes going over. Then there was a huge pall of horrible, black smoke,” said Perkins. The Royal Navy decided to bomb and sink the Torrey Canyon. Only 23 of the 41 1,000lb bombs dropped in Operation Oil Buster actually hit the huge target. However, “the navy made an efficient job of it, providing a ‘spectacular’ not seen since the war,” wrote Guardian reporter, Dennis Barker, who passed away in 2015. Perhaps most spectacular of all, the RAF Buccaneers were followed by Hawker Hunters and Sea Vixens, and napalm was dropped in an effort to burn off the oil. The resulting “ring of fire” sent up a three-mile smoke plume that it was reported could be seen 100 miles away. Finally, on 30 March, the ship began to sink. The government also poured 10,000 tonnes of a BP-manufactured “detergent”, a crude first generation dispersant, into the sea and on the shore. In some cases, barrels of the stuff were literally rolled off cliffs. 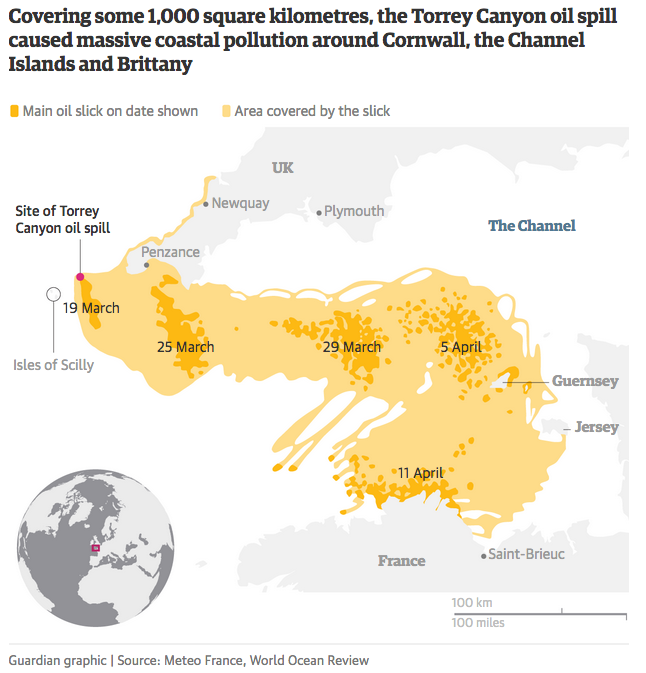 “BP, whose oil it was, was selling detergent in industrial quantities which was getting poured over the beaches, killing off the microorganisms which would have broken down the oil,” said Tony Soper, now 88, who reported on the story for the Western Morning News. Hawkins, who has just this week been taking samples at Porthleven in West Cornwall, found that areas where the detergents were not used, because of concerns over seals, recovered in two to three years, compared with the 13-14 years where the detergents were deployed. “By the time the oil got to Guernsey, they didn’t treat things with dispersant. They learned from the lessons,” said Hawkins. While the wildlife has recovered in the decades since, some of the disaster’s consequences are felt even now. Some experts draw a direct line between the incident and the creation in 1970 of the government’s environment department, the first of its kind in the world. Dispersant sprayed into the harbour. Lambert also credits the incident with sparking the first big rush of environmental volunteering. People travelled from Bristol and further afield in an attempt to clean birds, in sinks at hairdressers, at dedicated animal rescue centres and reportedly even in prisons. “We take eco volunteering as normal now, but this was the first big example in Britain. The tragedy was that most of these birds were beyond help and they died,” said Lambert. Torrey Canyon made household names of some environmentalists, including a Durham University botany and ecology lecturer called David Bellamy. An RSPCA notice in Cornwall informs people where to take injured birds. He remembers coming to public notice after being interviewed on TV by John Craven. 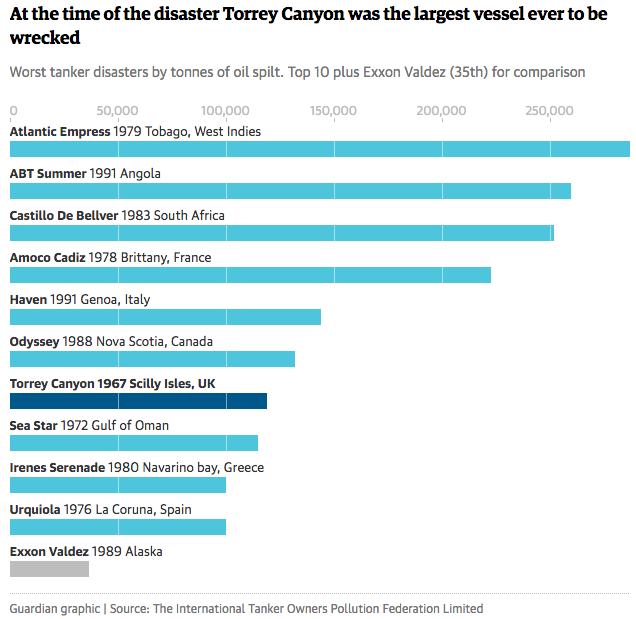 Government and industry responses to oil spills are much better today, partly as a result of Torrey Canyon, according to Hawkins. Oil spill contingency plans, something that did not exist in 1967, are in place around the coast. On rocky coasts, spilled oil is considered best left alone, while in more vulnerable areas such as salt marshes, booms are deployed. The dispersants deployed are much less toxic, and rarely used at the shore. “The response is much more proportionate now,” said Hawkins. Soldiers clean up the oil slick on the beach of Perros-Guirec. The International Maritime Organization said that many of the measures to prevent a spill employed by today’s shipping industry, such as double hulls and duplicate navigation controls, can be traced back to the disaster of 1967. Industry statistics show the number of shipping spills worldwide is down 90% since the 1970s; 99.9% of crude oil last year was delivered safely. While Torrey Canyon’s physical impact has virtually disappeared, there is one place it lives on, in the English Channel. Nineteen days after the tanker ran aground, the oil reached Guernsey’s beaches, sparking an emergency operation to scoop it up and send 3,000 tonnes of it, mixed with sand, to a granite quarry on the island. Onlookers watch the distant bombing of the stricken Torrey Canyon. Some of the oil was later recovered and burned for power in the 1980s, but most sat in the quarry’s waters, occasionally coating guillemots in oil. Eventually, micro-organisms were deployed in 2008 to munch the oil, but after a large quantity of oil surged to the surface in 2009, more extreme measures were called for. 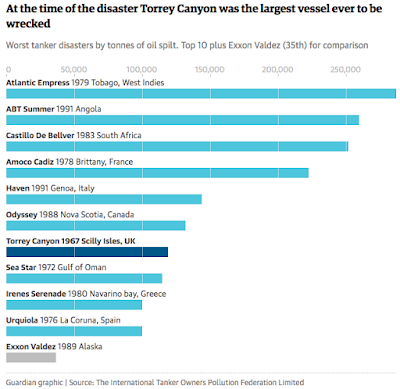 In total, 160,000 litres of contaminated water was removed by buckets – but an unknown quantity of the Torrey Canyon’s oil still remains below the surface. “It’s just looking like a pond now,” said Steve Byrne, manager of the GSPCA animal shelter, which has had no reports of oiled birds since 2012. Plymouth Herald : Is Britain ready for another Torrey Canyon oil disaster? whether it is to sail or to watch, we are going back from whence we came. Let's not take this place for granted!